Whoever said “beauty is only skin deep” apparently never watched a Lamborghini get built. Thanks to the Italian automaker, those shallow types can head over to the Paris 2011 JEC composite show, and see their latest supercar, sans skin. 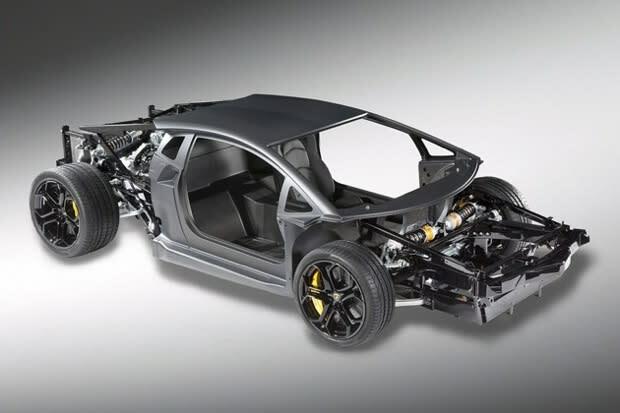 Built with a reinforced carbon fiber composite that was developed in conjunction with Boeing, the Aventador LP700-4’s naked chassis looks right at home in the showcase of materials and technology. And since composites also comprise many of the car’s other components, including wheels, frame and seats, there’s a little more to look at than just a carbon tub. Automobili Lamborghini&apos;s participation in the 2011 edition of the JEC Composite Show in Paris - one of the world&apos;s most important exhibitions of composite materials - is intended to emphasize the company&apos;s leadership in this highly specialized sector, not only in applying these materials in mass production (as shown by the new Aventador LP 700-4), but also in the investigation and development of new manufacturing technologies and the resulting product spin-offs. The use of composite materials reinforced with carbon fiber is becoming increasingly widespread in the automotive sector, as revealed by a study by Lucintel that foresees a growth of 65% over the next 5 years. Many manufacturers are working on developing and applying these technologies so they can build lighter vehicles that make an important contribution to reducing fuel consumption and air pollution, through improvements that include increasing the strength of the vehicle&apos;s structures. Automobili Lamborghini&apos;s extensive experience with using composite materials reinforced with carbon fiber in the super sports car sector is demonstrated by the Sesto Elemento concept car, where these materials have resulted in maximum stiffness with minimum weight. During the presentation of the vehicle at the exhibition, Luciano De Oto, the Chief of the Lamborghini Advanced Composite Research Center (ACRC), noted that the complete vehicle weighs only 999 Kg, as compared with the 1410 Kg of a Gallardo. At its Advanced Composite Research Center (ACRC, a section of the Automobili Lamborghini Research & Development department directed by Maurizio Reggiani), the Sant&apos;Agata Bolognese-based company is working on what technicians describe as "the new frontier" in materials reinforced with carbon fiber. The company already offers a host of applications for CFRPs, with particular focus on components that can be built without the need of an autoclave. A prime example is forged composite, which adds new prerogatives to the more traditional processes in the autoclave. During his presentation at the JEC session devoted to the automotive sector, Mr. De Oto explained that the most significant development in this regard is a "hybrid" combination employing long, unidirectional carbon fiber. What&apos;s more, ACRC research and development activities aim at obtaining from forged composite, through its pairing with finishing materials during the molding process, components that meet Class A appearance specifications.